Yesterday (Sunday) we continued work on the exterior trim - specifically the windows. I already had the pieces cut, and stained/sealed. We still needed to bevel edges for rain run off (and then stain/seal the newly exposed edges) before we were ready for install. All of my exterior trim is rough cedar. I used a dark brown cedar for my sill as an accent color piece that matches my window trim and roof color. We started by beveling the sill to slant downwards for rain run off. We first tried a 45 degree angle and it was too steep. Then we tried 221/5 degree and I still didn't really like the look of that - plus you are reducing the surface touching the house where you can put in screws to affix the trim to the house. Then we tried and 11 degree cut and I liked that - so that's what I'm using for all of my beveled edges. Bevel the bottom edge of the 2x2 window sill. Bevel the top edge of the 1x3 to accept the angle of sill. Bevel the bottom of the vertical 1x6 side pieces so they match the sill. Bevel the top of the 1x6 over the window piece for rain run off. Lots of beveling! We spent a fair amount of time arriving at the correct bevel angle, and also holding the trim pieces up to be sure we were assembling things correctly and in the logical order. I had (foolishly) thought the trim would just zip, zip and go up, but no, we only got one window done yesterday. But as with the windows, now that we have all the parts figured out, and all the measurements done, the rest will go considerably faster. If you look closely at the last photo of this entry you can see window fasteners. 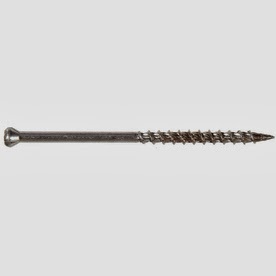 I used Stainless Steel Star-Drive Wood Screws by The Hillman Group, available at Lowe's. (You can also order a similar product from Amazon. Home Depot does not carry them; nor do Do It Best stores - well at least not in my area - Home Depot in LA carries them.) I used the 3" length to affix the 2x2"s and I think I used 2" (?) for the remainder of the trim. Stainless steel will ensure that they will not rust and I won't have rust drip marks down my cedar over time. And the low profile head makes them a great choice for finish work. We did pre-drill holes before sinking the screws. You can countersink them and putty the holes, but I'm choosing to leave my exposed, and to be aware of fastener placement so that they cater to my OCD. In the plumbing department, I talked with Daniel a few nights ago and he answered more of my questions and I hung up feeling empowered - I can totally do the plumbing now. It is SUCH a relief. Yesterday I got under the trailer and measured the spacing between the trailer joists where the tanks will live, so now I can get quotes on time and pricing for having those made. YES! Onward! I am going to be out of pocket now for a few days, so no construction for me this week. : ( It's hard to walk away from it. Nice work and i must say that your work will give many ladies inspiration so now many of them will do the carpenter work with there hands and by this you can make your choice furniture.